Learn about Gullah culture and life on Daufuskie Island with Sallie Ann Robinson, a 6th generation Daufuskie Island native and authority on Gullah culture and one of Pat Conroy's "star students" from his best selling novel, "The Water is Wide". 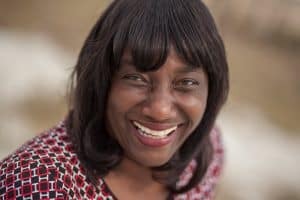 Authority of Gullah culture, Sallie Ann Robinson is a sixth generation native on Daufuskie Island and has been featured in programs such as QVC, The Food Network, and The Travel Channel’s “Bizarre Foods” with Andrew Zimmern. Sallie has also been a frequent favorite in magazines such as National Geographic, Southern Living, The South Magazine, and Hilton Head Monthly. As a child, bridge-less Daufuskie Island was Sallie’s playground and her life was filled with tales from elders. The famous author Pat Conroy taught Sallie Ann along with many Gullah children at the Maryfield School, and their time together is remembered in Conroy’s bestselling book The Water is Wide(fun fact – Sallie Ann was “Ethel” in the novel and Daufuskie is known as “Yamacraw Island”). Nowadays, Robinson is a recognized TV personality, celebrity chef, and spokesperson for preserving the legacy of Gullah culture. She is an author to two Gullah cookbooks; “Gullah Home Cooking the Daufuskie Way” and “Cooking the Gullah Way, Morning, Noon, and Night”. Sallie Ann is Daufuskie Island’s only native professional guide and her tours are currently offered through Tour Daufuskie on Tuesdays, Thursdays and Saturdays 11am and 2pm. Reservations are required and space is limited. This intimate guided golf cart tour will give you personal insight to what Daufuskie was like decades ago as well as to what it has become today. You’ll hear stories about the folks who not only impacted Sallie’s life, but the lives of many others who called and call Daufuskie their home. Comeyah and book yo Gullah Native Tour with Da Gullah diva Sallie Ann….autographed copies of Sallie Ann’s cook books will be available for purchase.